Enriched Air Nitrox is a blended gas that had more oxygen in it than regular compressed air. The additional oxygen levels allow you to stay down longer as you are absorbing less nitrogen on your dive. This lets you do longer dives in a shorter period of time, but also requires you stay at shallower depths. Many people report feeling less tired after diving with Nitrox as well. 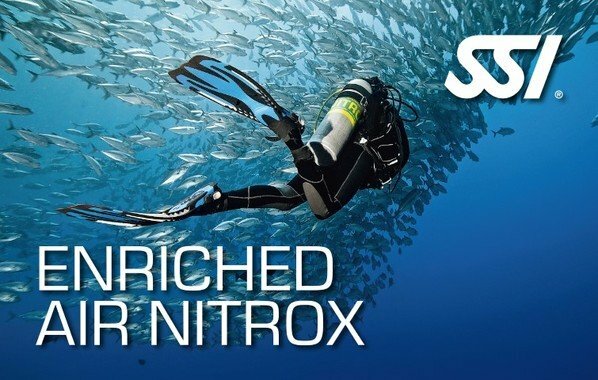 Learn all the benefits and hazards of diving with Nitrox, how to analyze a tank to know exactly the O2 content, the special equipment you may need, and how Nitrox affects your body. This is a classroom-only course that is usually completed in a few hours. Just read the online digital material, do the homework, come in for an evening of instruction and you are ready to dive!